Dorothy Ann Hovell passed through Heaven’s gates on Thursday, August 23, 2018, at the age of 99. She was a resident of Manor Court of Clinton, and former member of the Heyworth Community. A graveside service will celebrate her life at the Bushnell Township Cemetery on Thursday, August 30 at 11:00 am. Calvert-Belangee-Bruce Funeral Home, Heyworth is in charge of arrangements with Rev. Richard Gray officiating the service. There will be no visitation. Dorothy was born April 21, 1919, to Harry Ralston and Nellie Lillie (Kepple) Westlake. She was married for 55 years to her loving husband, Weldon Richard Hovell saying goodbye to him on March 3, 1992. Four brothers, Jay, Wayne, Everett, and Kenneth and one sister, Bonnie; a son, Richard L. Hovell; son-in-law, Kevin R. Rustemeyer preceded her in death. She is survived by her daughters, Mary Ann (Charles) Ball of Annawan, IL, Cathy (Lawrence) Handley of Eureka Springs, AR and Cynthia Rustemeyer of Heyworth; 14 grandchildren; 26 great-grandchildren; and 4 great-great-grandchildren. Family and friends were Dorothy’s passion and delight. 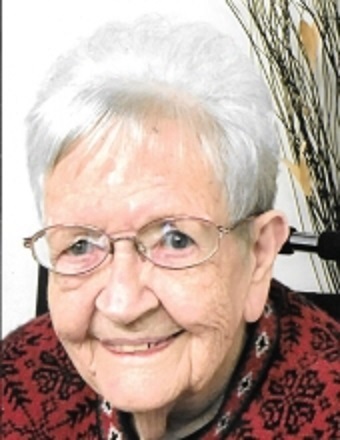 She had an unwavering faith in God and practiced her love for the Lord as a member of the Heyworth Christian Church where she was involved in numerous senior events. Her great sense of humor and quick smile brightened the day of many of those around her. She was lovingly cared for by Dr. Brit Williams and the staff at Manor Court. The family gives them their greatest gratitude. In lieu of flowers, memorial donations may be made to the Activity Program at Manor Court of Clinton, 1 Park Lane West, Clinton, IL 61727 or for senior programming at the Heyworth Christian Church, 308 N. Vine St., Heyworth, IL 61745. Her life was a blessing and her memory will be a treasure.